Click on link or picture to run. Opens in new window. Click on video link to see how to run each generator. Build your own free elapsed time worksheets that include answer sheets. Options to quiz on elapsed time, start time, or end time. Create clocks set to 1, 5, 10, 15, 30, or 60 minute increments. 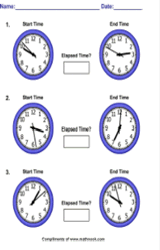 Build your own free telling time worksheets that include answer sheets. Options to test on drawing hands or reading clock. 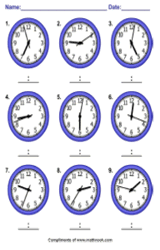 Create clocks set to 1, 5, 10, 15, 30, or 60 minute increments. Build your own addition, subtraction, multiplication or division worksheets that include answer sheets. Specify size of numbers in the problems as well as size of the answers. 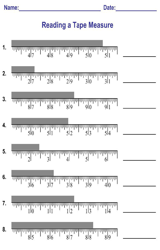 Generate your own reading a tape measurement worksheets that include answer sheets. Specify increments from 1 inch to 1/32 inch, title, and other options to create your own personalized worksheets to use in the home or classroom. 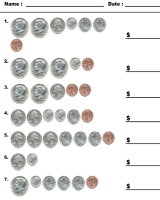 Build your own custom counting money worksheets with our free to use Money Worksheet Generator. 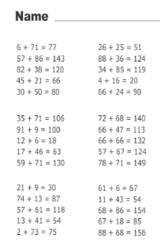 Specify which coins to use as well as how many coins to use in each problem. Use your customized worksheets in the classroom or home.